Comment offers the first publicly available empirical assessment of several pro se reform efforts thus far. The analysis shows that these pro se reforms have not succeeded in improving pro se litigants’ win rates at trial. This Comment thus suggests that, while pro se reforms likely have important merits, such as enabling a more thorough and dignified hearing process for pro se litigants, on average these reforms do not alter the final outcomes of the litigation process. Posner’s resignation is a powerful reminder of the challenges pro se litigants continue to face. His belief that pro se litigants are frequently mistreated in civil litigation and denied a full and fair opportunity to vindicate their claims is neither new nor limited to federal appellate courts.3 Numerous legal commentators have expressed similar concerns.4 Yet, though the belief that pro se litigants are underserved by the legal community is widespread, the full extent of the challenges they face in court is still only partially understood. At the same time, there has been considerable consternation over the growing volume of judicial and legal resources consumed by pro se litigants.5 Many pro se litigants bring dubious claims.6 Time and energy expended on these claims is time and energy that cannot be expended on other legal issues. Any reform must simultaneously balance a number of key policy goals: it should ensure the ability of pro se litigants to receive fair trials without unfairly disadvantaging their adversaries, allocate sufficient resources to ensure quick and fair hearings while avoiding overdrawing on judicial and legal resources that might instead be put to more urgent needs,7 and be practicable within the Supreme Court’s current jurisprudence and the statutory authority granted to courts by Congress. This Comment furthers the legal community’s understanding of issues in pro se litigation by conducting an empirical analysis of pro se reforms in federal district courts. By comparing case outcomes for pro se litigants in district courts that have implemented these types of reforms with the outcomes of similarly situated pro se litigants in courts that have not implemented any reforms, this Comment provides an initial assessment of the impact of those reforms. The analysis reveals that thus far, a wide range of reforms undertaken by federal district courts have not significantly impacted case outcomes for pro se litigants. This analysis conflicts with the intuitions of the Supreme Court, commentators, and judges and clerks of district court offices, who have indicated their belief that these reforms are effective. Importantly, this Comment does not suggest that these reforms have been failures. These reforms may have improved the pro se litigation process by making it feel more humane and easier to understand and by giving litigants a stronger sense that their concerns have been heard. Moreover, these reforms may still ease the burden of pro se litigation on courts by helping courts understand the issues involved more clearly or by moving cases through the judicial system more quickly. The analysis does suggest, however, that district court reforms have been ineffective in improving case outcomes for pro se litigants, and alternative approaches should be considered. Accordingly, this Comment suggests that pro se trial court reform is not the silver bullet that some commentators have hoped for in the quest to remedy the shortcomings of the pro se litigation process. In order to meaningfully improve case outcomes for pro se litigants, the legal community will either need to implement different and potentially more dramatic reforms than those implemented thus far or consider another approach altogether, such as renewed advocacy for “civil Gideon.”12 Alternatively, it is also possible that there is no cost-effective way to improve case outcomes for civil pro se litigants in the context of the modern US legal system. This Comment does not analyze the merits of these options. Instead, it strongly suggests that a different solution is needed to ensure pro se litigants get a full and equal opportunity to have their claims redressed via litigation. Comment and identifies some opportunities for future research. litigant’s interest in personal liberty, not the general interests of litigants in vindicating legal rights, was the critical question in determining whether the litigant has a right to counsel.39 Accordingly, in a blow to civil Gideon activists, the Supreme Court held that there was a “presumption that there is no right to appointed counsel in the absence of at least a potential deprivation of physical liberty,” signaling the Supreme Court’s reluctance to extend the right to counsel to civil litigants.40 Lassiter remains good law. Courts have implemented a number of different programs and procedures to assist pro se litigants. For example, the 2011 FJC Survey revealed that twenty-five districts allowed pro se law clerks to directly communicate with pro se litigants about their cases; thirty-five districts allowed pro se litigants to electronically access information about the docket sheet, pleadings, and more through case management/electronic case filing (CM/ECF); nineteen disseminated information about programs for pro se litigants outside the court, such as in public libraries; and ten provided software specifically designed to help pro se litigants prepare their proceedings.66 These types of reforms mirror those suggested by the Supreme Court in Turner:67 for example, providing notice to pro se civil litigants of important issues affecting the case and using forms to solicit relevant information. Likewise, giving access to the docket sheet and pleadings through CM/ECF and allowing communication with a pro se law clerk somewhat fulfills the Supreme Court’s suggestion to increase efforts to provide pro se litigants with notice. The pro se software typically helps simplify filing and participation in civil proceedings, similar to forms that would solicit relevant information. a. There were 66 respondents; they mentioned 89 measures. a. There were 33 respondents; they mentioned 49 measures. This Part discusses trends in civil pro se litigation in federal district courts. It examines several important characteristics of pro se litigation: the volume, typical outcomes, and typical types of suits brought by pro se litigants. It then describes some implications of this data and thus helps contextualize the empirical analyses of pro se reforms that Parts III and IV present. As seen in Table 2A, civil nonprisoner pro se litigation appears to comprise a stable proportion of federal district courts’ dockets.78 Averaged over several four-year time periods, the percentage of cases in federal district courts that were filed by pro se plaintiffs has ranged only from 9 to 10 percent. However, that still constitutes an average of more than fifteen thousand federal district court cases each year involving nonprisoner pro se plaintiffs. Similarly, the percentage of cases that have been answered by pro se defendants has hovered around 2 percent. Commentators writing about pro se litigation over the past twenty years have typically described pro se litigation as a large and growing portion of the federal docket.79 However, when the scope of the inquiry is limited to nonprisoner pro se litigation, this trend does not show up in the AO data. There has been a meaningful upward trend in the total number of pro se cases. But the percent of cases brought by pro se plaintiffs has not changed significantly, as seen in Table 2A, suggesting pro se litigation comprises a relatively stable portion of the federal docket. One of the most important aspects of pro se litigation in federal district courts is that pro se litigants fare extremely poorly. This is generally understood in the literature.82 However, the magnitude of the disparity between pro se and represented litigants is not always highlighted. Accordingly, this Section presents statistics on typical outcomes for represented and pro se litigants in trial. Tables 2.2 and 2.3 show the win rates of plaintiffs and defendants in cases that reach a final judgment based on whether both parties are represented, the plaintiff is proceeding pro se, or the defendant is proceeding pro se. As Tables 2.2 and 2.3 demonstrate, the presence of a pro se plaintiff or pro se defendant dramatically changes the dynamics of litigation. When both parties are represented and there is a recorded final judgment for either the plaintiff or the defendant, the plaintiff and the defendant each win roughly 50 percent of the time. When the plaintiff proceeds pro se, the plaintiff instead wins about 4 percent of the time. When the defendant proceeds pro se, the plaintiff wins 86 percent of the time. These differences are stark. A represented defendant will nearly always prevail over a pro se plaintiff in court. A represented plaintiff will win almost as consistently against a pro se defendant. Though dramatic, these numbers do not necessarily imply that lack of access to counsel worsens case outcomes for pro se litigants. There are a number of plausible explanations for low win rates by pro se litigants even if pro se litigants are not disadvantaged in court. For instance, and likely most significantly, because lawyers frequently work on a contingency fee basis, a lawyer is more likely to agree to work on behalf of a plaintiff with a strong case than a plaintiff with a weak case.84 The stronger the plaintiff’s case, the higher the expected damages and expected payout for the lawyer. Hence, it is less likely that strong cases proceed pro se. Section provides several tables that highlight the frequency of pro se litigants across different types of legal claims and show which specific case types most frequently feature pro se litigants. Despite the fact that roughly 10 percent of federal district court litigation involves a pro se plaintiff, some types of litigation very rarely involve pro se plaintiffs, while other types of cases are brought by pro se plaintiffs much more than 10 percent of the time. The story is similar for pro se defendants, though the variation is less dramatic because pro se defendants comprise only 2 percent of defendants in civil suits in federal district courts. Even in light of this variance, pro se litigants comprise a significant raw number of civil suits in all categories. Table 2D shows the most common types of litigation in federal district courts and the frequency with which each type of case involves a pro se plaintiff or defendant. Pro se plaintiffs bring a disproportionately large percent of civil rights and employment discrimination cases. In contrast, pro se plaintiffs rarely bring other types of cases, such as products liability, contract, asbestos, and insurance cases.86 Table 2D also shows that the only types of cases that frequently involve pro se defendants are property cases, which are primarily foreclosure proceedings.87 Perhaps the most important takeaway from Table 2D is that a substantial proportion of many types of cases are brought by pro se plaintiffs. Though there is significant variance—pro se litigants bring 32 percent of civil rights cases but bring a more modest 8 percent of cases involving the government and 2 percent of insurance and product liability cases—pro se litigants are prevalent across many types of cases. Any reforms targeting just one type of lawsuit cannot fully address the scope of issues faced by pro se litigants. Tables 2E and 2F, the final tables in this Part, examine how win rates for pro se litigants vary across different types of cases. The win ratios in Table 2E compare the probability of a plaintiff winning when both parties are represented to the probability of a plaintiff winning when the plaintiff is a pro se plaintiff but the defendant is represented. In the column “Plaint Rep’d / Plaint Pro Se,” the number 2.0 would mean that plaintiffs win twice as often when both parties are represented as compared to cases in which the plaintiff is pro se. The higher the number, the better represented litigants fare relative to pro se litigants. Tables 2E and 2F show that there is considerable variance in the outcomes of different types of cases for both represented and pro se litigants. When plaintiffs proceed pro se, they win somewhere between 2 and 11 percent of cases, depending on the nature of the suit. When the defendant is pro se and the plaintiff is represented, the plaintiff wins somewhere between 43 percent and 93 percent of cases,89 depending on the nature of the suit. This substantial variance is not confined to pro se litigants. Even when both parties are represented, there is wide variance in the percentages of cases won by plaintiffs, ranging from just 13 percent in products liability and employment discrimination cases to 77 percent in property cases.90 But in essentially all categories, pro se litigants fare far worse than represented litigants. As Table 2D shows, pro se litigation comprises a significant fraction of almost all types of lawsuits in federal district courts. And as seen in Tables 2E and 2F, across essentially all of those lawsuits, pro se litigants fare dramatically worse than their represented counterparts. This Part presents an empirical analysis of pro se reforms made in federal district courts. It compares outcomes for pro se litigants in courts that have implemented reforms with outcomes for pro se litigants in courts that have not implemented reforms. The analysis discovers that outcomes are not substantially different in courts that have made these reforms. Hence, this Part suggests that pro se reforms in federal district courts have not impacted outcomes of pro se litigation despite evidence that clerks and judges in those courts believe the reforms are effective at achieving this goal. The analysis in this Part draws upon two different sources of data. The first data source is the same dataset used for the analysis in Part II: the AO Dataset containing civil cases filed in US district courts. More generally, win rates are an imperfect outcome variable for evaluating the effectiveness of pro se reform, and some caution is warranted when making inferences based on this analysis. The thorniest issue is that a large portion of civil cases are disposed of in ways that do not typically result in final judgments being entered, so win rates do not directly shed light on how pro se litigants fare in those cases. Some district court reforms might plausibly result in more favorable settlements for pro se litigants, and thus improved outcomes for pro se litigants while not materially affecting the win rates of pro se litigants upon final judgment.97 That said, there is a good theoretical reason to believe that win rates upon final judgment correlate with the favorability of settlements: in typical litigation settings, if both parties have similar beliefs about the probability of winning at trial and make economically rational decisions, they ought to come to a settlement weighted to favor the party more likely to prevail at trial.98 The AO data, however, does not include any measure of settlement quality that could be used to confirm or analyze the relationship for these types of cases. Additionally, there is no obvious way to test the consistency or validity of these survey results. If different courts implemented substantively different reforms but mapped them to the same policies when answering the questionnaire, these results may underestimate the effectiveness of certain policies. For example, if one district court allowed pro se litigants to conduct extremely formal and limited communications with pro se clerks, while another district court allowed pro se litigants who showed up at the court to receive extensive counseling from pro se clerks, both district courts may report that they provided “direct communications with pro se clerks.”99 These two policies may be sufficiently distinct that they have very different influences on the outcomes of pro se litigation. The available survey data does not provide a reliable way to tease out these types of distinctions, and they are grouped together in the analysis below. Similarly, if overburdened district courts were simply sloppy in their survey responses, this methodology may in turn underestimate the results of these policies. Although case outcomes do not encompass all relevant information in assessing the impact or value of pro se reforms, they are nonetheless an important metric to consider. Lawyers are supposed to help their clients win cases. Accordingly, the viability of pro se reform as a substitute for better access to counsel should hinge in large part on its effectiveness at helping pro se litigants win those cases. Moreover, case outcomes are the typical metric that commentators consider when measuring the value of access to counsel to pro se litigants.101 Hence, when evaluating the tradeoffs of expanding pro se reform against expanding access to counsel, case outcomes are one of the most natural and salient measures. The analysis compares differences in case outcomes in different sets of district courts. The sets are determined either by whether the district court adopted a particular pro se reform or by the total number of reforms the district court has adopted. By comparing these results, this Part attempts to determine the effectiveness of these reforms. Unfortunately for this empirical exercise, district courts do not randomly decide whether to implement a particular reform. If these pro se reforms had been randomly assigned, then this analysis would mimic an experiment, and it would be safer to conclude (provided the statistics suggested so) that any differences in case outcomes shown in the tables below were causal. Without random assignment of pro se reforms to district courts, the conclusions of this analysis may suffer from selection bias. For example, courts that are particularly favorable to pro se litigants might also be more likely to implement reforms. If pro se litigants happened to fare better in these courts, it would be difficult to empirically discern whether litigants fare better because of the reforms or the favorable attitude, and some measure of the district court’s favorability toward pro se litigants could be an important omitted variable. In order to evaluate the effects of different pro se reform measures undertaken by district courts, this Section compares the win rates of pro se litigants in courts that have enacted each of the reforms discussed in the FJC Survey with the win rates of litigants in the districts that have not enacted those same reforms. Table 3A compares the win rates for plaintiffs in cases in which both parties are represented with those in which either the plaintiff or defendant is pro se based on whether the district court employs a particular policy. Comment—appear to have no more than a 1 percent impact on the percent of pro se litigants that actually win cases in court. Perhaps more likely, they do not actually impact case outcomes at all, and the 1 percent variation is simply noise. Regardless of whether they account for some small improvement, however, these results show that pro se reforms are not significantly moving the needle in terms of case outcomes. Any potential improvement is substantially smaller than what the experimental literature suggests would result from improved access to counsel.112 Hence, compared to pro se win rates with a lawyer, these reforms cannot be considered a meaningful substitute for access to counsel even if they yield a small improvement, at least insofar as the goal is to help pro se litigants win more cases. Table 3B looks at the same questions for pro se defendants, and it tells the same story as Table 3A. Pro se defendants do not reap any more benefits in terms of case outcomes from pro se reform than pro se plaintiffs. At least for the reforms considered in the FJC Survey, none seems individually effective. Table 3C relies on the same data but considers the win rates of different types of litigants based on the total number of policies that the district court has implemented rather than which particular policies the court has implemented. Table 3C thus seeks to test the slightly different hypothesis that there may be a cumulative benefit from implementing these policies even if none is individually impactful. Table 3C tells a similar story as Tables 3A and 3B. Although there is some variation in the win rates, there is no discernable pattern. Pro se litigants do not consistently have better case outcomes in districts that have implemented more policies aimed at improving the lot of pro se litigants. Instead, the win rates of pro se litigants deviate only a couple of percentage points from the overall average win rates for pro se litigants even in districts that have implemented three, four, or more of the policies considered in this Comment. This Part focuses on an extensive set of pro se reforms made in the federal district court in EDNY. Because these reforms were publicly announced around the time of their implementation, this Part conducts a difference-in-differences analysis of these reforms to complement the differences analysis from Part III.116 This analysis strengthens the results in Part III, suggesting that pro se reforms have not impacted case outcomes for pro se litigants. Table 3B—providing forms and handbooks as well as individual case assistance, for instance. Because this reform effort is different from those that Part III discusses, it’s hard to directly compare them. But both sets of reforms fit into a similar broad bucket: attempts by courts to improve the pro se litigation process by facilitating simpler and more convenient interactions between pro se litigants and the courts. To date, a public, empirical assessment of the effects of this office on outcomes of pro se litigation is not available. This Part seeks to begin to fill that gap by evaluating the impact of EDNY’s reforms on the pro se process. Part IV.B discusses the methodology for this analysis. Part IV.C finds that the reforms in the EDNY have had a small, and in fact negative, impact on the win rates of pro se litigants in that court.123 This evidence, when combined with the evidence in Part III, strengthens this Comment’s finding that pro se reforms in trial courts have been ineffectual at improving litigation outcomes for pro se litigants. analysis.124 The analysis below attempts only to assess the impact of the creation of the pro se office over its first five years of existence. Specific information about subsequent reforms implemented by the office is not readily available and hence not ripe for analysis. However, any such reforms may have had a different impact on case outcomes for pro se litigants and, accordingly, may indicate more promising future directions for pro se reform. In order to evaluate the impact of EDNY’s pro se reforms, this Comment runs a logistic regression using whether the plaintiff won the case as the independent variable. The dataset for this regression is all cases decided in the four New York district courts between 1998 and 2007 that involved pro se plaintiffs and represented defendants. This dataset includes 578 cases from the Northern District of New York (NDNY), 2,658 cases from EDNY, 3,843 cases from SDNY, and 668 cases from the Western District of New York (WDNY). The key variable of interest is a binary variable that is coded “1” if the case is in EDNY and filed after the implementation of the pro se reforms and “0” otherwise.125 There were 1,408 cases in this dataset from after EDNY implemented the reforms. There are a few potential omitted variables that this analysis is unable to capture. One possible issue is changing caseloads in each district over time. If the composition of EDNY’s pro se docket shifted in a different way than New York’s other district courts in the years surrounding the reform, that may hide the impact of EDNY’s reforms. Another possibility is that noncourt legal actors may have changed their strategies in response to EDNY reforms. If, for example, outside legal aid clinics started shifting their resources to non-EDNY courts in response to this reform, possibly because those clinics knew that pro se litigants would receive adequate assistance in EDNY due to the reforms, that may also mask the impact of these reforms in EDNY. 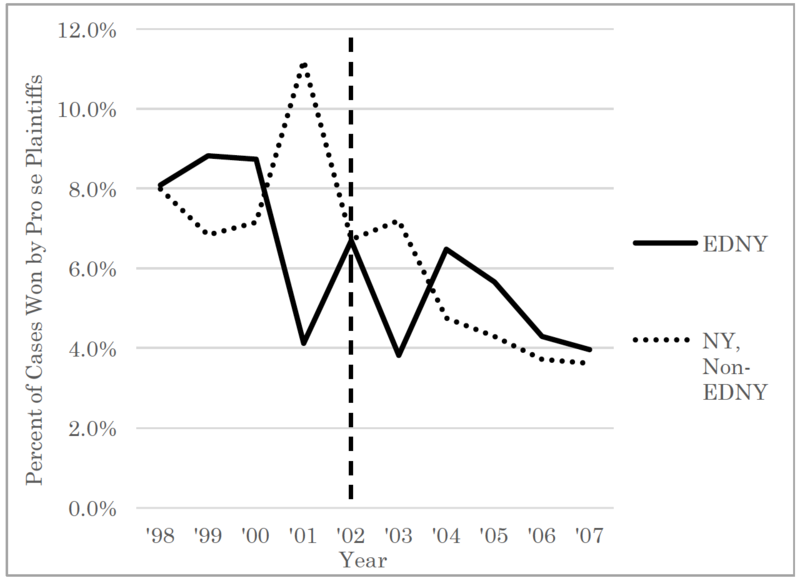 Finally, because this analysis compares the outcomes of pro se litigation in EDNY with outcomes of pro se litigation in the other New York district courts, if those district courts also made improvements to the pro se litigation process during this time period, the analysis might understate the effect of the EDNY reforms. From an initial look at Figure 1, no meaningful change in the outcomes of pro se litigation in EDNY appears in the years following the creation of the pro se magistrate’s office. Instead, for all district courts in the New York area, there is seemingly considerable variance in case outcomes on a yearly basis, with pro se litigants performing very similarly on average in both sets of districts before and after the pro se reform. However, Figure 1 does reflect the possibility that the percent of cases won by pro se plaintiffs in the other New York district courts trended downward more than in EDNY. But this is uncertain. With the exception of 1999, the win rates of pro se litigants are relatively similar in EDNY to New York’s other district courts. From Figure 1, it’s difficult to tell whether there is a trend in EDNY meaningfully different from the trend seen in other New York district courts. To investigate this further, this Comment runs the logistic regression described above. Table 4 displays the results of that regression. Because the outcome variable is whether a plaintiff wins or loses a particular case, and each of the independent variables in this regression is a binary dummy variable, the coefficients describe the change in the probability of a case outcome when the variable is set to 1 instead of 0. Hence, a coefficient of 0.5 on the variable “EDNY Reform Dummy” would imply that EDNY Reform increased the chances of a pro se plaintiff winning a case by 0.5 percent. Table 4 suggests that, like the other pro se reforms that Part III considers, the pro se reforms in EDNY have not been effective in improving case outcomes for pro se litigants. The coefficient on the dummy variable indicating whether the EDNY pro se reforms were instituted is -0.59, and the 95 percent confidence interval suggests that there is some nonzero negative effect when no controls are instituted in the first model in column one.128 The results are similar for the second and third models except that, once all districts are controlled for, the negative impact of the reform is statistically significant. When dummies are introduced corresponding to the year of each case filing, this negative effect disappears and the fourth and fifth models indicate no statistically significant impact from the reform. Including the full set of controls for year and district, the 95 percent confidence interval suggests that the reforms in EDNY had an impact of somewhere between -0.43 percent and 0.51 percent on the win rates for pro se litigants, with a statistically insignificant mean estimated impact of 0.04 percent.129 These results suggest that pro se reforms were not effective at improving win rates for pro se litigants. Comment is five to ten years old. Courts may have developed more promising innovations in the meantime, but this type of analysis would not be able to detect those benefits until most or all of the litigation begun in those years has run its course. Additionally, it’s possible that some of these reforms are significantly impacting case outcomes for prisoner pro se litigants, which may separately be an important goal of these reforms. One important takeaway from this Comment, related to the limitations described above, is the importance of additional studies into the effectiveness of other reform measures, especially reform measures undertaken in courts other than federal district courts. As previously mentioned, other courts throughout the country have experimented with ways to help pro se litigants.130 Although the particular reforms analyzed here appear to have been ineffective, other reforms undertaken by other courts might achieve better results. With sufficient empirical legwork, successful reforms can be identified, and other courts can learn from those successes. Although courts likely attempt to learn from each other’s practices, without empirical validation of these techniques, there’s a risk that the blind are leading the blind. More empirical studies could help show the way. Additional studies that help determine the extent to which differences in access to counsel are responsible for the gaps in case outcomes between pro se and represented litigants, especially across a broader range of types of cases, would also be useful. If differences in access to counsel explain differences in case outcomes, the legal community should be more fearful that those without adequate resources are being deprived of meaningful access to the legal system. Moreover, if communities that lack the means to gain access to counsel lack effective legal recourse, despite sometimes having meritorious claims, then the legal community should also worry that bad actors can gain by depriving those communities of legal rights without facing the deterrent effects of litigation. Concerns about exploitative employers may be heightened if more than 2 percent of pro se plaintiffs have fully meritorious claims but only 2 percent of those plaintiffs can effectively seek relief due to difficulties navigating the legal system. Conversely, if lack of access to counsel does not explain poor case outcomes for pro se litigants, perhaps the legal community should focus on other considerations, such as making pro se litigants feel that they have received a fair chance in court and had their grievances heard, rather than trying to narrow the gaps in case outcomes or provide lawyers for more pro se litigants. Acknowledging the limits described above, this Comment does find that pro se reform in federal district courts has not yet meaningfully impacted case outcomes for pro se litigants, whereas increased access to counsel has had somewhat more promising results in the experimental literature.131 The policy implications of those facts are not immediately clear. These results suggest that increased access to counsel may help pro se litigants vindicate rights; however, the wisdom of that approach depends on whether the costs of that increased access to counsel outweigh the benefits or whether there are cheaper ways to achieve those benefits. One critical question in this vein is whether there are more effective reform opportunities available to courts, because more effective reforms could still conceivably enable improved outcomes for pro se litigants at a lower cost than increased access to counsel. This Comment finds little evidence that measures thus far implemented by courts have improved case outcomes. Hence, merely renewing and expanding similar reforms does not appear to be an especially promising path forward. One more effective path might look toward a growing body of research on more effective ways to provide self-help resources and literature to pro se litigants. A recent article by Professors Greiner, Dalié Jiménez, and Lois R. Lupica details their endeavors to develop a theory of the issues that potential pro se civil litigants would face in the legal process. Their article then draws on recent developments in a number of fields, such as education, psychology, and public health, to imagine what truly effective self-help materials would look like and how they might help pro se litigants fare better at trial.132 Courts and commentators could try to enhance the effectiveness of their reform efforts by drawing on this and other similar research. Using this kind of research to provide effective educational handbooks or to help courts communicate in ways that are more useful to pro se litigants could enhance the types of pro se reforms analyzed in this Comment. Finally, one other potential policy implication suggested by this Comment is that expanded access to counsel for certain pro se litigants may be an attractive option. This Comment does not fully analyze the potential costs or benefits of civil Gideon and accordingly comes to no conclusion about its overall merits.133 However, many commentators have opposed civil Gideon partially on the grounds that pro se reforms at the trial court level could be a cheaper, but still effective, alternative.134 The Supreme Court has suggested a similar belief.135 But while not totally conclusive for the reasons described above, this Comment indicates that those reforms have not had the kind of impact on case outcomes that increased access to counsel might have. Because these reforms do not yet appear to be a viable and effective alternative to civil Gideon, this Comment suggests that improved case outcomes may be better achieved through expanded access to counsel than through pro se reforms. The challenges presented by the large volume of pro se cases in federal district courts may require meaningful changes to achieve a full resolution. In order to make headway on that front, reformers must properly contextualize and understand the nature of pro se litigation in those courts and evaluate the successes and failures of efforts that have been undertaken thus far. This Comment presents commentators with a perspective on the volume, types, and typical success rates of pro se litigants in federal district courts. It shows that nonprisoner pro se litigants comprise a meaningful percentage of the federal docket. Moreover, pro se litigants show up in substantial numbers across many different types of litigation, from property cases, to torts cases, to civil rights cases. However, in nearly all of those types of cases, pro se litigants fare at least several times worse than represented litigants; overall, pro se plaintiffs are less than one-tenth as likely to win cases as represented plaintiffs, whereas pro se defendants are only about one-third as likely to win cases as represented defendants. Moreover, this Comment assesses the effects of reforms in federal district courts aimed at helping pro se litigants. It suggests that, despite widespread optimism from numerous stakeholders in the American legal community, reforms to federal district courts intended to improve the pro se litigation process have thus far had a negligible impact on the outcomes of pro se litigation. If the goal is to improve case outcomes for pro se litigants, or to replace the potential positive impact of increased access to counsel at a lower cost, the types of reforms undertaken thus far appear to have been unsuccessful. The AO dataset is created and made available through the Federal Judicial Center.136 This Comment’s processing of the AO dataset closely mirrors the processing implemented in other legal scholarship.137 The dataset used in this analysis includes cases terminated between June 1988 and June 2017 as well as pending cases. In addition to dropping the above cases, I undertook a series of steps to consolidate multiple records from certain cases and prevent those cases from being double-counted. To do so, I first created unique identifiers for each case based on the district, office, and docket number of its first filing. I then used those unique identifiers to consolidate multiple records that correspond to the same case into single records. I considered the filing date to be the first date on which the case was filed and the termination date to be the final date on which the case was terminated. 1. See David Lat, The Backstory behind Judge Richard Posner’s Retirement (Above the Law, Sept 7, 2017), archived at http://perma.cc/AW74-5TQ6. 3. Many commentators share the same concerns about indigent criminal defendants. However, because criminal defendants are guaranteed access to counsel, they face a somewhat different set of challenges than pro se civil litigants and are not the focus of the analysis of this Comment. For one critical discussion of the treatment of indigent criminal defendants, see generally Stephen B. Bright, Legal Representation for the Poor: Can Society Afford This Much Injustice?, 75 Mo L Rev 683 (2010). But see J. Harvie Wilkinson III, In Defense of American Criminal Justice, 67 Vand L Rev 1099, 1127–29 (2014) (arguing that representation of criminal indigent defendants is generally of high quality). Chicago: Justice for the “Little Guy”?, 72 Nw U L Rev 947 (1978) (discussing deficiencies of pro se small claims courts). See also Margaret Martin Barry, Accessing Justice: Are Pro Se Clinics a Reasonable Response to the Lack of Pro Bono Legal Services and Should Law School Clinics Conduct Them?, 67 Fordham L Rev 1879, 1926 (1999) (describing the pro se system as one that “sacrifices justice for expediency”). 5. See generally, for example, Committee on Federal Courts of the New York State Bar Association, Pro Se Litigation in the Second Circuit, 62 St John’s L Rev 571 (1988) (suggesting solutions to combat an exploding pro se docket); Benjamin H. Barton and Stephanos Bibas, Triaging Appointed-Counsel Funding and Pro Se Access to Justice, 160 U Pa L Rev 967 (2012) (arguing that there are more cost-efficient approaches to improving pro se litigation than a constitutional right to counsel in civil cases because of the considerable resources that it would require). 6. The Supreme Court has indicated awareness of this issue. See Neitzke v Williams, 490 US 319, 326 (1989) (noting “the problems in judicial administration caused by the surfeit of meritless in forma pauperis complaints in the federal courts, not the least of which is the possibility that meritorious complaints will receive inadequate attention or be difficult to identify amidst the overwhelming number of meritless complaints”). 7. At least some commentators have expressed concern that allocating more legal resources to pro se civil litigants might take away from resources needed for indigent criminal defense. See Barton and Bibas, 160 U Pa L Rev at 980–81 (cited in note 5). It is important, however, to recognize that legal resources also may trade off with nonlegal resources, and an analysis accounting for these trade-offs may make the economics of expanded legal resources for pro se litigants look more attractive. Additional money spent on lawyers or pro se assistance might be more economical than it first appears if, for example, additional state spending in an eviction or wrongful termination proceeding saves the government from paying for homeless shelters or welfare assistance at a later date. 8. See, for example, note 60 and accompanying text. 9. See generally Jessica K. Steinberg, Demand Side Reform in the Poor People’s Court, 47 Conn L Rev 741 (2015) (arguing for “demand side” procedural and judicial reform to assist pro se litigants as opposed to the “supply side” reform of simply providing counsel to pro se litigants); Barton and Bibas, 160 U Pa L Rev 967 (cited in note 5). 10. For more discussion, see Part I.C. 11. See Donna Stienstra, Jared Bataillon, and Jason A. Cantone, Assistance to Pro Se Litigants in U.S. District Courts: A Report on Surveys of Clerks of Court and Chief Judges *3 (Federal Judicial Center, 2011), archived at http://perma.cc/8TYT-7Y43 (reporting that 90 percent of the US district courts surveyed have adopted at least one procedural reform). income persons in various civil legal proceedings. For more discussion about the contours of this movement, see Part I.B. 13. 564 US 431 (2011). 14. See notes 41–45 and accompanying text. 15. “Right to counsel” in this Comment refers to a litigant’s right to have an attorney provided if the litigant is unable to afford a lawyer. In other contexts, it is sometimes defined more narrowly, such as a right to a lawyer only in the case of criminal defense or a right to a lawyer only if a litigant can afford his or her own lawyer. See generally, Note, The Indigent’s Right to Counsel in Civil Cases, 76 Yale L J 545 (1967). 16. US Const Amend VI. 18. See, for example, Gagnon v Scarpelli, 411 US 778, 789 (1973) (discussing how differences between criminal trials and civil proceedings, such as lack of a state prosecutor and less formal procedure, eliminate the need for a categorical guarantee of a right to counsel for defendants in some civil proceedings even when a loss might lead to their incarceration). 19. See Argersinger v Hamlin, 407 US 25, 40 (1972) (holding that, “[u]nder the rule we announce today, every judge will know when the trial of a misdemeanor starts that no imprisonment may be imposed, even though local law permits it, unless the accused is represented by counsel”). 20. 287 US 45 (1932). Whether this would be so in other criminal prosecutions, or under other circumstances, we need not determine. All that it is necessary now to decide, as we do decide, is that in a capital case . . . it is the duty of the court, whether requested or not, to assign counsel for him as a necessary requisite of due process of law. 23. 304 US 458 (1938). 26. 316 US 455 (1942). 27. Id at 473 (“[W]e cannot say that the [Fourteenth] Amendment embodies an inexorable command that no trial for any offense, or in any court, can be fairly conducted and justice accorded a defendant who is not represented by counsel.”). 28. Gideon v Wainwright, 372 US 335, 341 (1963). 29. 372 US 335 (1963). 32. Famously, Gideon submitted a handwritten petition for certiorari. See generally Petition for a Writ of Certiorari, Gideon v Wainwright, No 155 (US filed Jan 5, 1962), archived at http://perma.cc/EZ34-ZMLZ. 33. Gideon, 372 US at 341–43. 34. 407 US 25 (1972). 35. See Gideon, 372 US at 343–45; Argersinger, 407 US at 37 (extending Gideon to cover misdemeanor, as well as felony, offenses for which imprisionment could be imposed). 36. See Benjamin H. Barton, Against Civil Gideon (and for Pro Se Court Reform), 62 Fla L Rev 1227, 1238–41 (2010) (discussing the post-Gideon wave of civil litigation aimed toward extending its logic and protections to civil pro se litigants). 37. 452 US 18 (1981). 41. Turner, 564 US at 435. Arguably, this goes even further than Lassiter in denying the right to counsel for civil litigants; under Lassiter, there arguably should have been a presumption in favor of the right to appointed counsel because there was a “potential deprivation of physical liberty.” Lassiter, 452 US at 31. 42. Turner, 564 US at 435. 43. Id at 447–48 (citations omitted). Note that safeguards, such as additional forms to elicit relevant information or additional notice about critical issues, are potentially similar, though not identical, to reforms such as giving pro se litigants access to an electronic version of the docket or allowing additional communication with a clerk at the court (the reforms analyzed in Part III). 44. Or at least foreclosing the possibility of the Supreme Court expanding the right to counsel for civil litigants. See Steinberg, 47 Conn L Rev at 788 (cited in note 9) (noting that “[t]he court unanimously rejected a guarantee of counsel, greatly disappointing civil Gideon proponents”); Barton and Bibas, 160 U Pa L Rev at 970 (cited in note 5) (noting that “Turner dealt the death blow to hopes for a federally imposed civil Gideon”). Bibas, 160 U Pa L Rev at 970 (cited in note 5) (noting that, “[i]n rejecting a broad new constitutional right, the Court steered toward more sustainable reform for pro se litigants”). 46. See Barton and Bibas, 160 U Pa L Rev at 978 (cited in note 5) (“Calls for a parallel Gideon right in civil cases followed almost immediately on the heels of Gideon. As early as 1965, an indigent litigant argued [for the provision of counsel in a civil suit].”). Association House of Delegates, Aug 7, 2006), archived at http://perma.cc/A98M-RGG3. 48. Andrew Scherer, Why People Who Face Losing Their Homes in Legal Proceedings Must Have a Right to Counsel, 3 Cardozo Pub L Pol & Ethics J 699, 701–03 (2006). See also, for example, Ramji-Nogales, Schoenholtz, and Schrag, 60 Stan L Rev at 384 (cited in note 47). The arguments in these articles focus on civil litigation regarding housing or immigration, but the arguments hold more generally when a party’s ability to vindicate important interests is at stake. 49. See, for example, Barton and Bibas, 160 U Pa L Rev at 980 (cited in note 5) (identifying flaws in the arguments of civil Gideon advocates); Barton, 62 Fla L Rev at 1249 (cited in note 36) (describing it as “quite unlikely that the current Court would even take a civil Gideon case”). See also generally Laura K. Abel, A Right to Counsel in Civil Cases: Lessons from Gideon v. Wainwright, 15 Temple Political & CR L Rev 527 (2006). 50. For one helpful discussion of how and why the efficacy of Gideon has been doubted, see Donald A. Dripps, Why Gideon Failed: Politics and Feedback Loops in the Reform of Criminal Justice, 70 Wash & Lee L Rev 883, 894–99 (2013). But see Wilkinson, 67 Vand L Rev at 1127–29 (cited in note 3) (arguing that criminal defense lawyers appointed to represent indigent defendants are typically effective). 51. See Dripps, 70 Wash & Lee L Rev at 895–99 (cited in note 50). 52. For a list of numerous such efforts, see D. James Greiner and Cassandra Wolos Pattanayak, Randomized Evaluation in Legal Assistance: What Difference Does Representation (Offer and Actual Use) Make?, 121 Yale L J 2118, 2175–79 n 154 (2012). 53. A factor of 1.19 indicates that a represented litigant is 1.19 times more likely to win than a pro se litigant in the same case. Some of these studies were conducted in different litigation contexts, and there is no a priori reason to believe that access to counsel has a similar impact on all types of litigation, so a large range in win ratios like the one seen here could conceivably be accurate. Still, the gap between a win ratio of 1.19 and 13.79 is sufficiently large to suggest uncertainty in these results. See Rebecca L. Sandefur, The Impact of Counsel: An Analysis of Empirical Evidence, 9 Seattle J Soc Just 51, 70 (2010). 55. See Greiner and Pattanayak, 121 Yale L J at 2196–98 (cited in note 52). 56. See id at 2197–98. 57. See Greiner, Pattanayak, and Hennessy, 126 Harv L Rev at 919–20 (cited in note 47). 58. See id at 925–31. 59. However, it is likely premature to express confidence about how these results would transfer to other types of litigation; it may be the case that access to counsel is especially effective (or, for that matter, ineffective) at improving case outcomes for pro se litigants in the housing context. 60. See generally Barton and Bibas, 160 U Pa L Rev 967 (cited in note 5); Steinberg, 47 Conn L Rev 741 (cited in note 9). 61. See, for example, Drew A. Swank, In Defense of Rules and Roles: The Need to Curb Extreme Forms of Pro Se Assistance and Accommodation in Litigation, 54 Am U L Rev 1537, 1583–93 (2005) (arguing that, by playing an active role in the litigation process, a judge becomes an interested party and may become biased—which violates the ideal American judicial role of a “neutral referee”—and may be unfairly advantaged if they are excused for procedural mistakes while represented litigants still bear the costs of procedural mistakes their lawyers may make). 62. See, for example, Robert Bacharach and Lyn Entzeroth, Judicial Advocacy in Pro Se Litigation: A Return to Neutrality, 42 Ind L Rev 19, 34–35 (2009) (arguing that “ad hoc” rules applied to pro se litigants often end up disadvantaging rather than aiding pro se litigants, and specifically describing how attempts by judges to help pro se litigants make initial claims could lead to more dismissals of those claims, thus threatening their pauper status). 63. As an example, pro se reforms could be counterproductive in a streamlined pro se office at a district court that consistently suggests dismissing pro se cases before a full hearing. For a more detailed discussion of entities that have called for civil Gideon rather than pro se trial court reform, and the contexts in which they have done so, see Greiner, Pattanayak, and Hennessy, 126 Harv L Rev at 906–07 (cited in note 47). 64. See Stienstra, Bataillon, and Cantone, Assistance to Pro Se Litigants in U.S.
District Courts at *1 (cited in note 11). 65. See Barton and Bibas, 160 U Pa L Rev at 988 (cited in note 5) (noting that civil courts in San Antonio have been experimenting with pro se reforms). 66. See Stienstra, Bataillon, and Cantone, Assistance to Pro Se Litigants in U.S.
District Courts at *2 (cited in note 11). Supreme Court’s criteria would be no more effective than these pro se reforms. 68. Table 1A records the responses of clerks’ offices to the question “What are the most effective measures your district has implemented to date to help the clerk’s office, prisoner pro se litigants, and nonprisoner pro se litigants?” under the sections “Measures that help nonprisoner pro se litigants.” Importantly, this is separated from “Measures that help the clerk’s office” and “Measures that help prisoner pro se litigants.” The responses to those latter questions differ meaningfully from the responses concerning measures effective at helping nonprisoner pro se litigants. The chief judges were similarly asked to separate measures that helped nonprisoner pro se litigants from measures that helped the court or prisoner pro se litigants. See Stienstra, Bataillon, and Cantone, Assistance to Pro Se Litigants in U.S. District Courts at *15, 17, 35, 54, 61 (cited in note 11). 69. Table 1A has been reproduced from the FJC Survey, in which it was originally labeled Table 15. Stienstra, Bataillon, and Cantone, Assistance to Pro Se Litigants in U.S. District Courts at *17 (cited in note 11). 70. Table 1B has been reproduced from the FJC Survey, in which it was originally labeled Table 29. Id at *35. 71. The questionnaire does not go into further detail about what “helping” nonprisoner pro se litigants means. Accordingly, it is possible that judges believe these reforms are helping pro se litigants in ways other than helping them win more cases. 72. See generally Filing a Civil Case without an Attorney: A Guide for the Pro Se Litigant (United States District Court for the Northern District of Illinois, Sept 30, 2016), archived at http://perma.cc/CGA6-TKR8. 73. See Pro Se Information (United States District Court for the Northern District of Illinois, 2017), archived at http://perma.cc/P6JD-2WNF. 74. See generally, for example, Lois Bloom and Helen Hershkoff, Federal Courts, Magistrate Judges, and the Pro Se Plaintiff, 16 Notre Dame J L, Ethics & Pub Pol 475 (2002). 75. As discussed elsewhere, this Comment does not purport to claim that impacts on case outcomes are the only potentially important effect of these reforms nor that the reforms fail by those other metrics. For a more detailed discussion, see Part III.A. 76. It is important to note that, although this Comment is limited to analyzing suits filed in federal district courts, a large volume of pro se litigation occurs in state courts. Some specialized courts, such as those focused on domestic relations, have high portions of their dockets devoted to pro se cases. However, many nonspecialized state courts also have a significant volume of pro se cases. Further, many pro se litigants in federal district courts appeal their cases, resulting in substantial pro se litigation in federal appellate courts. For more discussion of pro se litigation throughout the US legal system, see generally, Stephan Landsman, The Growing Challenge of Pro Se Litigation, 13 Lewis & Clark L Rev 439 (2009). For one example of pro se reform undertaken by specific state courts and the effects of those reforms on litigation, see Eovaldi and Meyers, 72 Nw U L Rev at 975–78 (cited in note 4). 78. Civil pro se litigation by prisoners is heavily concentrated in two pseudocriminal types of proceedings: prisoner habeas corpus petitions (nature of suit code 530) and prisoner civil rights petitions (nature of suit code 550). For a more detailed description of these fields, see generally Integrated Data Base Civil Documentation (cited in note 77). 79. See, for example, Landsman, 13 Lewis & Clark L Rev at 441–42 (cited in note 76). 80. There are many factors affecting trends in prisoner pro se litigation that likely do not impact nonprisoner pro se litigation, such as the growth of the US prison population and concerns about the particular conditions and resources available to prisoners. For one discussion of prisoner pro se litigation, see generally Michael W. Martin, Foreword: Root Causes of the Pro Se Prisoner Litigation Crisis, 80 Fordham L Rev 1219 (2011). 81. Some reasons that these reforms may impact prisoners differently from nonprisoners include: differences in the types of cases brought, potentially different access to legal resources (depending on the availability of legal materials in prison), different judicial attitudes toward prisoner and nonprisoner pro se litigants, or different levels of access to counsel. Note that this Comment does not definitively suggest these reforms impact nonprisoner and prisoner pro se litigants differently. Instead, it merely suggests there may be differences and limits the scope of this analysis to nonprisoner pro se litigants. 82. See, for example, Landsman, 13 Lewis & Clark L Rev at 442 (cited in note 76). 83. Table 2C simply removes cases classified as “Missing/Unknown” or “Both” from Table 2B and recalculates the percentages. All analyses of cases reaching final judgment in this Comment focus on the subset of case dispositions that commonly reach final judgment. Cases dismissed for want of prosecution, that settle, or that otherwise do not typically receive entry of final judgment on resolution are excluded from these analyses. For more discussion of the calculation methodology, see Appendix: AO Data Processing. 84. For one discussion of this phenomenon, see John Leubsdorf, The Contingency Factor in Attorney Fee Awards, 90 Yale L J 473, 475–82 (1981). 85. Although it’s difficult to pinpoint the factors most responsible for the unfavorable outcomes for many or most pro se litigants, some issues that many district judges cite in explaining the typical challenges of pro se litigants include: pro se plaintiffs’ lack of ability to write legally comprehensible pleadings or submissions, lack of ability to respond to legal motions in fruitful ways, lack of knowledge about relevant legal precedents, issues with timeliness in the legal process, and failure to understand the legal consequences of their actions. For a more complete list of issues that judges perceive pro se litigants face, see Stienstra, Bataillon, and Cantone, Assistance to Pro Se Litigants in U.S. District Courts at *21–23 (cited in note 11). 86. This is unsurprising given the large financial stakes often involved in those cases and the prospective availability of contingency fees. 87. In fact, there is an upward trend over time in the percentage of property suits involving a pro se defendant. Among property suits filed in district courts in 2016, 23 percent involved a pro se defendant (based on the data used in Table 2D). 88. There were no cases in the sample in which a defendant in an asbestos case proceeded on a pro se basis and the plaintiff won the case. Accordingly, “N/A” is recorded for the numbers that would otherwise have this zero in the denominator. 89. With the exception of asbestos litigation. However, there were only two asbestos cases in the sample with pro se defendants. 90. The low percentages here may reflect high settlement rates for strong products liability or asbestos cases so that many cases that plaintiffs would win instead settle. 91. Property cases are an interesting exception, with a represented plaintiff still 0.88 times as likely to win a case against a represented litigant as against a pro se defendant. Though the noncausal nature of the comparisons weighs against drawing any overly significant inferences from this fact, it does suggest that the trend toward increasing numbers of defendants proceeding pro se in property suits might not be a particularly important issue. 92. See note 64 and accompanying text. 93. The questionnaire directed to chief judges did not include comparable questions about policies that district courts have implemented to assist nonprisoner pro se litigants. 94. See the policies listed in Tables 1 and 2 of Stienstra, Bataillon, and Cantone, Assistance to Pro Se Litigants in U.S. District Courts at *2–3 (cited in note 11). Note that there are two additional policies in those tables that are only for prisoner, as opposed to nonprisoner, pro se litigants and thus are excluded from this analysis. 95. Data is unavailable for three policies: procedural assistance by clerk’s office staff members as part of their regular duties, appointment of counsel to represent a pro se litigant for the full case, and appointment of counsel to represent a pro se litigant in limited circumstances. See id. Although it would be interesting to conduct an analysis similar to that conducted in the following Section for each of these policies, there is no obvious reason that the absence of this data would undermine any of the following results beyond the fact that an analysis similar to that conducted below could conceivably come to different conclusions for those policies. 96. For a discussion from the early 2000s, see Bloom and Hershkoff, 16 Notre Dame J L, Ethics & Pub Pol at 488–97 (cited in note 74). To the extent that this is a risk, a follow-up study could be conducted by surveying the current practices of district courts and then using a similar method to the one employed in this Comment to check whether differences in current district court practices are impacting more recent outcomes for pro se litigants. 97. Conceivably, these reforms could even adversely affect win rates by convincing pro se litigants with strong cases to accept favorable settlements. 98. See, for example, J.J. Prescott and Kathryn E. Spier, A Comprehensive Theory of Civil Settlement, 91 NYU L Rev 59, 60–61 (2016). 99. See Table 1 in Stienstra, Bataillon, and Cantone, Assistance to Pro Se Litigants in U.S. District Courts at *2 (cited in note 11). 100. For one discussion of potential benefits of litigation aside from the possibility of winning cases, see Lior Jacob Strahilevitz, Pseudonymous Litigation, 77 U Chi L Rev 1239, 1251 (2010). 101. See notes 53–59 and accompanying text. 102. The types of cases that typically result in final judgment, and are evaluated here, are cases that are disposed of following judgment on default, consent, motion before trial, jury verdict, directed verdict, court trial, arbitral award, or other resolution. Cases disposed of via transfer or remand or dismissed due to settlement, voluntary dismissal, lack of jurisdiction, or want of prosecution are discarded in this analysis. 103. The concern with omitted variable bias is that some other variable not included in the model explains both the independent and dependent variable in the model. For example, in this case there could be an “omitted variable” measuring how much courts care about protecting pro se litigants. A court with judges who care a lot about protecting pro se litigants may implement many pro se reforms and also have favorable case outcomes for pro se litigants because the judges are favorable to pro se litigants. Though it is difficult to rule out all omitted variables, in this case the widespread implementation of at least some reforms, coupled with the significant variation in which and how many are implemented by each court, suggests this kind of omitted variable is unlikely. For more discussion of omitted variable bias, see generally Kevin A. Clarke, The Phantom Menace: Omitted Variable Bias in Econometric Research, 22 Conflict Mgmt & Peace Sci 341 (2005). 104. See Stienstra, Bataillon, and Cantone, Assistance to Pro Se Litigants in U.S.
District Courts at *3 (cited in note 11) (“[T]here appears to be no relationship between the number of services offered to pro se litigants and the average number of pro se filings in the district.”). 106. See id at *2. 107. Because almost all US district courts responded to the FJC Survey, there is no selection bias related to which district courts responded to the FJC Survey either. 108. For example, it could be the case that there is some correlation between the types of reforms implemented and the practices of the judges on the court. If one reform is particularly expensive or cumbersome, courts with judges that are favorably disposed toward pro se litigants may be more likely to implement it. 109. It is worth noting that these reforms could produce unobservable benefits in a number of ways. For example, as discussed previously, some district courts may be implementing these reforms differently in practice, and it may be the case that a few are successfully implementing the reforms, resulting in significant improvements to case outcomes for those courts but not enough improvement to show up in the overall numbers. Alternately, it may be the case that one particular combination of reforms is especially impactful. There is not enough data to fruitfully study all permutations of reforms. Still, this analysis is revealing with respect to the cumulative effects of these reforms. 110. See note 84 and accompanying text. 111. For a discussion of this and other selection bias issues related to the nonrandom assignment of which cases proceed pro se, see Greiner and Pattanayak, 121 Yale L J at 2188–95 (cited in note 52). 112. See notes 52–59 and accompanying text for discussion of the experimental results. 113. But note that represented litigants in courts that have implemented these reforms also win cases 8 or 9 percent more frequently than they lose cases, so it’s plausible that the courts that have implemented those reforms are just more plaintiff-friendly (or typically handle cases that favor plaintiffs) or that these differences reflect more noise than signal. See Table 3A. 114. See text accompanying notes 41–45 and 66–67 for discussion of what Turner and commentators have called for. 115. At least insofar as these reforms are designed to substitute for additional access to counsel and help pro se litigants win more cases. As discussed previously, the fact that these reforms have not improved case outcomes does not imply that these reforms have not positively impacted other aspects of pro se litigation. 116. A difference-in-differences analysis is an analysis that looks at two samples (here, EDNY pro se litigant outcomes and non-EDNY pro se litigant outcomes) and compares the difference in the average result between those two groups before and after a treatment. This analysis compares the difference between EDNY and non-EDNY pro se litigant outcomes before the pro se reform with the difference between EDNY and non-EDNY pro se litigant outcomes after the pro se reform. Non-EDNY in this analysis refers to all New York federal district courts other than EDNY: the Northern District of New York, SDNY, and Western District of New York. The treatment effect is the difference between these two differences—that is, the difference in differences. For more discussion of this methodology, see generally Marianne Bertrand, Esther Duflo, and Sendhil Mullainathan, How Much Should We Trust Differences-in-Differences Estimates?, 119 Q J Econ 249 (2004). 117. Bloom and Hershkoff, 16 Notre Dame J L, Ethics & Pub Pol at 476–77 (cited in note 74). 119. See id at 496–97 (discussing in more detail how pro se litigation is handled in EDNY). 120. Id at 496. The only exceptions to the practice of sending all screened pro se cases to the magistrate judge are for Social Security appeals and federal prisoner petitions seeking habeas corpus relief. Id. 121. See Bloom and Hershkoff, 16 Notre Dame J L, Ethics & Pub Pol at 493–94 (cited in note 74). About 15 percent of civil cases were pro se cases in 1999, and a substantial percentage of those cases were prisoner pro se cases, so the percent of the docket comprised of nonprisoner pro se cases was relatively close to the typical 9 percent of the federal docket for the time period that Table 2A covers. Further, the bulk of those cases were civil rights cases, employment discrimination cases, and Social Security cases. The former two categories are also the most typical types of nonprisoner pro se litigation in this analysis, as Table 2D shows. 123. Note that this does not necessarily imply the pro se reforms in EDNY are failing to improve the litigation process for pro se litigants. See notes 97–100 and accompanying text. It is conceivable that, for example, the reforms in EDNY have led to higher average settlement values for pro se plaintiffs and thus improved overall outcomes for pro se litigants. Moreover, there could be important benefits to a litigation process in which pro se litigants feel more fully heard and in which the process is more dignified for pro se litigants. This office could be creating large benefits for pro se litigants in EDNY overall. However, this analysis is restricted to case outcomes. Further, the pro se reforms in EDNY may be making a positive impact in terms of the efficiency side of the equation, helping to dispose of pro se cases more quickly and efficiently than would otherwise be the case and reducing the overall burden of pro se cases on the court despite not improving case outcomes for pro se litigants. 124. In 2002, Magistrate Judge Lois Bloom of the pro se office cowrote an article making it clear that the office was intended as an imperfect step toward addressing the problem with the intention of adapting the institution over time. See Bloom and Hershkoff, 16 Notre Dame J L, Ethics & Pub Pol at 517 (cited in note 74). 125. Although the reform was implemented in May 2001, this Comment codes this variable to 1 only for all cases filed in 2002 and after. The theoretical reason for this is to give the reform the benefit of the doubt; it may have had an effect, but that effect may appear only after it was integrated into EDNY’s normal pro se proceedings. In practice, the regression results do not meaningfully change if this variable is set to “1” for all cases filed in May 2001 and after. 126. A dummy variable is a variable that takes a value of either 0 or 1 to indicate whether data falls within a certain category. This enables regressions to capture the impact of non-numeric qualitative data. 127. The estimated coefficients have the same signs and similar magnitudes, and 95 percent confidence intervals similarly exclude the possibility of a statistically significant positive impact if a period of three or four years is considered instead of a five-year period. 128. However, this result is not robust against a different choice of years. For example, while the point estimate is still negative, the 95 percent confidence interval for a regression run on data from 1999 through 2006 includes zero (though the 90 percent confidence interval does not). Thus, the better takeaway at this point is not that the reform has had a negative impact on win rates but that it has not had a significant positive impact on win rates. 129. Running a linear, rather than logistic, regression—which may be more familiar to some readers—with the same specifications, the confidence interval for the estimated impact of EDNY reform is from -0.05 to 0.06, with a statistically insignificant mean estimated impact of 0.003 percent. 131. See text accompanying notes 52–59. 132. See generally D. James Greiner, Dalié Jiménez, and Lois R. Lupica, Self-Help, Reimagined, 92 Ind L J 1119 (2017). It is difficult to synthesize their conclusions into a simple path toward providing pro se litigants with effective assistance, but they emphasize in particular the need for breaking legal problems down into their constituent components, including mental, psychological, and cognitive issues, as well as identifying and implementing relevant research from nonlegal literature to address those problems. They emphasize in particular that often the “relevant tasks have little to do with formal law.” Id at 1172. 133. For example, this Comment does not consider how many resources would be required to enact civil Gideon nor whether they could be better used elsewhere. It also does not consider whether civil Gideon itself would be effective at improving civil pro se outcomes. While the experimental literature discussed earlier suggests that access to counsel improves case outcomes for pro se litigants, it is unclear whether a similar quality of counsel would be provided in a civil Gideon world. Indeed, the success of Gideon in the criminal context is a hotly debated subject, with many scholars considering it a disappointment. For an example of a scholar who considers Gideon a disappointment, see generally Erwin Chemerinsky, Lessons from Gideon, 122 Yale L J 2676 (2013). 135. See Turner, 564 US at 447–48. sy-1988-present (visited June 3, 2018). Note that the data used in this analysis was downloaded on October 3, 2017, and the data available through this link may have changed since that date. 137. See, for example, William H.J. Hubbard, Testing for Change in Procedural Standards, with Application to Bell Atlantic v. Twombly, 42 J Legal Stud 35, 61–63 (2013). 138. Case types 400, 520, 750, 810, 862, and 900. See Integrated Data Base Civil Documentation (cited in note 77). Note that several of these no longer are used. Code 900, for example, pertains to appeals of (typically minor) court fees. 139. Case types 150, 151, 152, and 153 include, for example, suits brought by the government for recovery on defaulted student loans or reimbursements of overpayments by the government of veteran benefits or Medicare payments. See id. These types of cases typically result in default. 140. The cases that are considered “prisoner pro se litigation” are those with a value of 510, 530, 535, 540, 550, and 555 in the nature of suit field, all of which are labeled as either a type of “prisoner petition” or a habeas petition from someone facing the death penalty. See id. Eisenberg and Margo Schlanger, The Reliability of the Administrative Office of the U.S. Courts Database: An Initial Empirical Analysis, 78 Notre Dame L Rev 1455 (2003). 142. See id at 1489.